Elegant vehicle for Preserved Figs, this dish is wonderful. 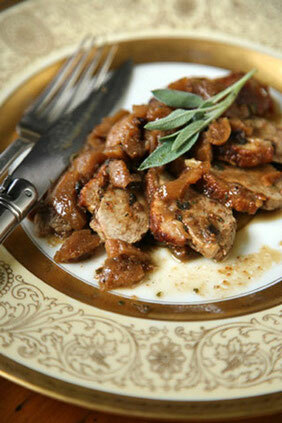 Four small pekin breasts or two large magret breasts make a rich, meaty counterpoint to the sweet, chunky figs in brandy. In order to cook evenly and create an attractive, crisp skin, trim all but a thin layer of fat from the duck breasts before cooking. 1. In a large bowl, mix oil, sage, garlic, orange zest, and chile flakes. Stir to combine. Season duck breasts with salt and pepper. Add breasts to the marinade, tossing them until they are evenly coated. Cover the breasts with plastic wrap and refrigerate for at least 30 minutes. 2. Heat a 12" skillet over a medium heat. Scrape the marinade from the duck breasts and transfer them to the pan, placing them fat side down. Brown the breasts, rendering the fat until it is brown and crisp, about 10–12 minutes. Invert the breasts with tongs and cook with the flesh side down, until the duck is medium rare, about 2–4 minutes. Transfer breasts to a serving platter and cover with foil. 3. Pour off all but 2 tbsp. fat from the skillet; strain and reserve the rest for another use. Add the shallots and cook, stirring frequently, over medium-low heat until they are soft and translucent, about 2 minutes. Add chopped figs, syrup, and broth to the skillet. Increase heat to medium high and boil gently, scraping the bottom of the pan to loosen the browned bits, until the sauce is reduced by half, about 5 minutes. Add the butter to the sauce and stir to combine; season with salt and pepper, if you like. Turn off heat and set sauce aside. 4. Transfer duck breasts to a cutting board. Pour any accumulated duck jus from the platter into the skillet; stir to combine. Thinly slice the duck breast on the bias and transfer pieces back to the platter. Spoon fig sauce over sliced duck and garnish with parsley and orange zest, if you like. Serve leftover fig sauce in a bowl alongside.